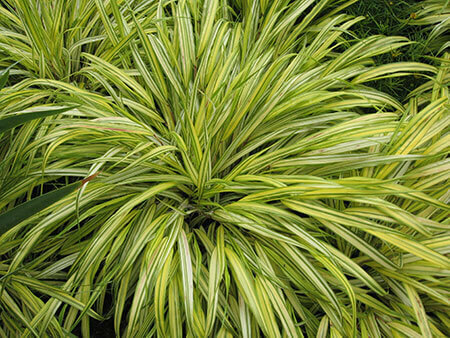 Hakonechloa macra 'Alboaurea' is a decidiousu dwarf ornamental grass which forms neat, spreading clumps of arching yellow and green variegated foliage. It will grow in full sun or partial shade, so long as the soil is not allowed to dry out. In late summer, small needle-like flowers appear. A good choice for contemporary gardens, it works well as underplanting or as an edging to paths.